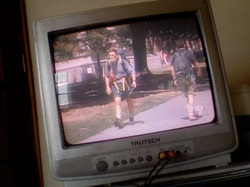 A friend watching a video of a show about a murder in Hanover, New Hampshire recognized me on the background footage and photographed me following the Appalachian Trail through town. I grew up in Danville, Virginia and discovered the Appalachian Trail about two months before graduating from the University of Virginia in 1970 with a BA in government. The draft was still on and I ended up in the Army, serving as a rifleman, radio operator and company clerk with 1st Cavalry Division in Vietnam, 1971. That experience taught me to carry a heavy pack over difficult terrain. Within months after returning from Vietnam in 1972 I began hiking an avocation that continued through graduate school and into my life. Those hikes took me into the Blue Ridge, Massanutten and Shenandoah Mountains. I moved to Arizona because it looked like an interesting place to hike. I hiked extensively throughout Arizona including enough Grand Canyon backcountry hikes to lose count. 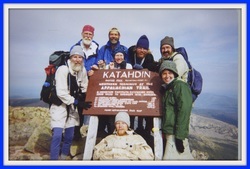 Other trips include the Long Trail in Vermont, Canadian Rockies and trails in Colorado, New Mexico and Utah. I have written my entire adult life as an evaluator communicating results to legislators and public policy makers. Not exactly engaging topics but the work did teach me how to write clearly and simply. I also learned how to observe, describe and inform. This experience allows me to present the daily tedium and work of thru-hiking in a way that engages rather than numbs the reader. Careful observation, building on years photographing and painting, breaks the narrative and offers diversion and interest to the reader. In the end, my qualifications come down to the fact that the story is my account of an adventure that only I can tell and my ability to present that story in an interesting, readable format. 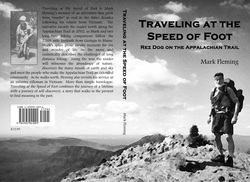 Mark Fleming, author of "At the Speed of Foot."